A small honing tool found in a cremation pit. We have just added a new video to our Gallery page (http://sat.org.uk/facebook-gallery/ ) its just under a minute long, but it shows how hard going the digging can be at Newbarns! After the deluge yesterday today was dry and eventually sunny. One of our Glasgow University students discovers a stake hole. We have been rather quiet this week on the Update front. Rest assured we have been working away, though the weather has slowed things down. The Site which was extreamly dry, with no flooded features three weeks ago, is now rather wet – meaning we cannot dig parts of the site. We had a visit from a group of Girl Guides on Thursday morning, who had a tour of the site, followed by finds washing and a look at thre best finds from the site. A few pictures of their visit will be posted later. We took advantage of the best day of the week, weather wise, to record a short video giving a potted history of the site. This will be posted to the website once editing and processing has taken place. 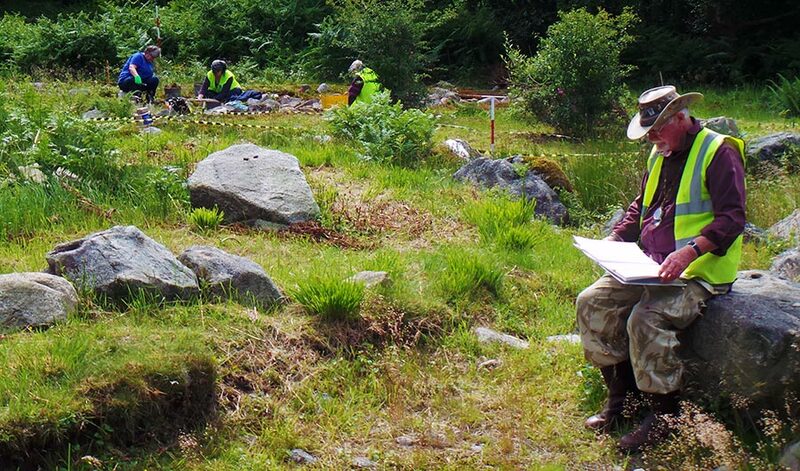 Here is our Excavation Director contmplating the site records, as a May, Jen and Kristina work away in the background.